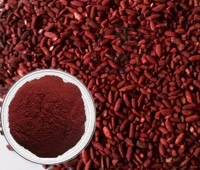 Red Yeast Rice is an extract with potent health benefits, and it is popularly sold as a supplement around the world. Interestingly, it is extracted from fermented rice, and it was discovered hundreds of years ago in Asia, where it is still used in traditional medicine. In addition to this, it is also used as a preservative, additive, and for food coloring. The secret to red yeast rice are the monacolins it contains, specifically the monacolin K. As a matter of fact, this is the same ingredient used in the prescription drug Mevacor (generic name Lovastatin), which is used to treat high cholesterol and triglyceride levels, reducing the chances of heart attack and blood vessel problems. Apart from monacolin, red yeast rice also contains healthy fats, sterols, and isoflavones. Red yeast rice has been studied extensively over the years, and we know that it can lower the levels of LDL (bad cholesterol). In fact, one particular study showed that using 2 grams of red yeast rice per day lowered LDL levels by 20% in just 12 weeks among the study subjects. Another study showed similar results - subjects used red yeast rice for just 8 weeks, and they had an LDL drop of a whopping 25%. Healthy fats are crucial for overall health, especially for those who follow western diets. These diets fail to get even close to the recommended daily amounts of healthy fats. What's more, bodybuilders and athletes need them to maintain proper overall joint and organ health, so they should pay a lot of attention to healthy fat intake. Furthermore, when a bodybuilder uses anabolic steroids, it is universal that a rise in bad LDL cholesterol and a drop in good cholesterol (HDL) will occur. The more androgenic compounds like trenbolone, testosterone, anadrol, and halotestin are especially notorious in this regard, as they will cause severe heart and lipid strain. This is why blood pressure will rise, and the domino effect of other problems (like poor sleep, nervousness, and fatigue) will occur when using those steroids. Therefore, red yeast rice is a must to use on any steroid cycle in order to counteract these problems. Besides, it should also be utilized when coming off steroids to help normalize cholesterol and all heart-related issues. Red yeast rice side effects are listed as upset stomach, heartburn, and headaches. However, when used at a correct dosage these sides are not noticeable. As a precaution measure, pregnant women should not use this supplement, and those who are already on statins should avoid using red yeast rice as well. Another possible issue may take place if you are allergic to fungus or yeast. Hence, if you are allergic or you have doubts about a potential allergy, you should be careful because the extract can contain them. The optimal dosage of red yeast rice is about 1 gram per day when used by itself. However, the best way to use it will be as part of a supplemental stack, and in that case roughly 30-50% of that dose is sufficient. The pharmaceutical industry is extremely powerful in the United States, as they spend billions a year on lobbyists and to buy politicians, who write favorable laws. As a result, we hear about many supplements out there that are bashed because doctors and pharmaceutical companies claim they do not work. As a consequence, red yeast rice is an interesting story, since it is a traditional remedy that drug companies claim they own the rights to. Thus, the FDA has attempted to control its sale and asked supplement makers Swanson and Sunburst Organics to stop selling it. Luckily, red yeast rice is still available online, but it is important to buy a quality version of it. N2Guard is an example of such high quality supplement that contains 300 milligrams (mg) of red yeast rice per serving, plus dozens of additional ingredients, making it a vert potent support supplement on the market. I use it daily to get my red yeast rice extract. Heart...how are you guys protecting?